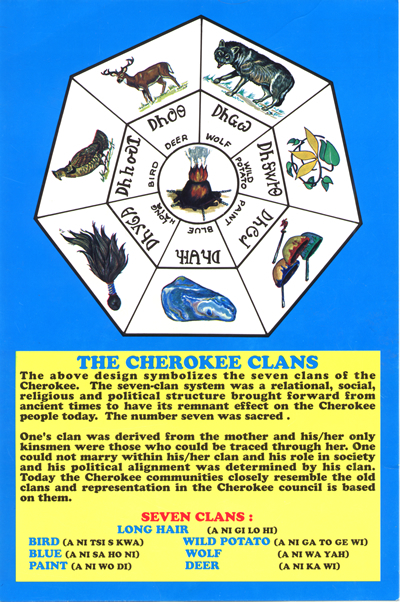 The Cherokee Clans are traditional social organizations of Cherokee society, and currently seven clans are recognized by the Cherokee. Customs of the Cherokee clans have evolved since ancient times; however, traditionalists still observe clan customs regarding marriage and certain social events. Most of the ancient Cherokee villages were situated along streams in scattered areas throughout the Appalachian Mountains. The life of the traditional Cherokee was guided by a faith in supernatural forces that linked humans to all other living things. Values rested on a relationship of people and place, family and clan, and community and council. Historically, villages operated as autonomous units, joined together for ceremonials and wars. Villages with their seven clans were laid out around a large town or council house with small individual dwellings surrounding these centers. The Cherokee society is historically a matrilineal society; meaning clanship is passed through the mother. Among the Cherokee, women were considered the head of the household, with the home and children belonging to her should she separate from a husband. The knowledge of a person's clan is important for many reasons; one of those reasons being that among Cherokee traditionalists today, it is forbidden to marry within your clan, as clan members are considered brothers and sisters. Knowledge of a person's clan is also important when seeking spiritual guidance and in traditional medicine ceremonies, as it is necessary to name the clan. Seating at ceremonial stomp dances is also delineated by clan. In ancient times, for Cherokees born outside of a clan or outsiders to be taken into the tribe, they had to be adopted into a clan by a clan mother. For a woman who was married to a Cherokee man and given birth to a Cherokee child, she could be taken into a new clan. However, her husband had to leave his clan and live with his wife in her new clan. Men who were not Cherokee but married into a Cherokee household had to be adopted into a different clan by a clan mother because he could not take his wife's clan. Blue (A NI SA HO NI), historically this clan made medicine from a blue-colored plant to keep the children well. They are also known as the Panther or Wild Cat Clan. Bird (A NI TSI S KWA), were historically known as messengers. The belief that birds are messengers between earth and heaven, or the People and Creator, gave the members of this clan the responsibility of caring for the birds. Paint (A NI WO DI), were historically known as a prominent healers medicine people. Medicine is often 'painted' on a patient after harvesting, mixing and performing other aspects of the ceremony. They made red paint and prepared teas for vapor therapy specific to each ailment. Deer (A NI KA WI), were historically known as fast runners and hunters. Even though they hunted game for subsistence, they respected and cared for the animals while they were living among them. They were also known as messengers on an earthly level, delivering messengers from village to village, or person to person. Wild Potato (A NI GA TO GE WI) historically, members of this clan were known to be 'keepers of the land' and gatherers of the wild potato in swamps along streams. They are also known as the Bear, Raccoon, or Blind Savannah Clan. Wolf (A NI WA YAH), is the largest and most prominent clan throughout time. During the time of the Peace Chief and War Chief government setting, the War Chief would come from this clan. Wolves are known as protectors. Genealogists and anyone tracing Cherokee ancestry are sure to find History of the Cherokee Indians especially illuminating; other readers curious about a more general history of the tribe will also find a wealth of insightful information about the Cherokee's conflicts with other tribes, adoption of its constitution, emigrations, treaties, and much more. A handful of black-and-white photographs illustrate this solid historical and genealogical accounting. From A Cherokee Encyclopedia: "Crowe, Amanda: Amanda Crowe was born in 1928 in the Qualla Cherokee community in North Carolina. She was drawing and carving at the age of 4 and selling her work at age 8. She received her MFA from the Chicago Arts Institute in 1952 and then studied in Mexico at the Instituto Allende in San Miguel under a John Quincy Adams fellowship. She had been away from home for 12 years when the Cherokee Historical Association invited her back to teach art and woodcarving at the Cherokee High School. . . ."
"Fields, Richard: Richard Fields was Chief of the Texas Cherokees from 1821 until his death in 1827. Assisted by Bowl and others, he spent much time in Mexico City, first with the Spanish government and later with the government of Mexico, trying to acquire a clear title to their land. They also had to contend with rumors started by white Texans regarding their intended alliances with Comanches, Tawakonis, and other Indian tribes to attack San Antonio. . . ."
About the Author: Robert J. Conley is the author of over seventy books. The Wordcraft Circle of Native Writers and Storytellers named him Wordcrafter of the Year for 1997. He has won numerous Spur Awards from the Western Writers of America and was presented with the Cherokee Medal of Honor in 2000. An enrolled member of the United Keetoowah Band of Cherokees, Conley lives with his wife, Evelyn, in Norman, Oklahoma. Recommended Reading: Cherokee Heritage Trails Guidebook, Barbara R. Duncan and Brett Riggs, The University of North Carolina Press (April 14, 2003) (432 pages). Description: Celebrating the rich heritage of the Eastern Band of Cherokee Indians, this guide introduces readers to important sites throughout the Cherokee homeland in western North Carolina, eastern Tennessee, and north Georgia. The book presents Cherokee stories, folk arts, and historical information as well as visiting information for Cherokee historic sites.